All photos Copyright (c) 2007 Scott C. Nevin and Linda C. McCabe, All Rights Reserved. In my last post I discussed how I set out to find places associated with Saint Namphaise. 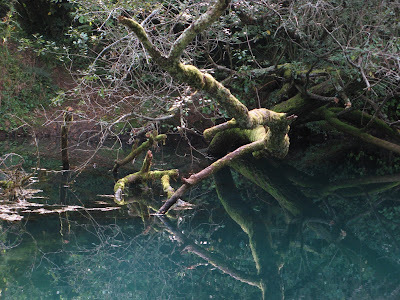 After my husband and I saw the hand lettered sign nailed to a tree telling us that we came upon "ce magnifique site" we noticed the pool of magical looking water. I think this pool was the abyss mentioned in the legend of Saint Namphaise. We walked past the water and came upon another small meadow that showed evidence of campfires. Visions of drunken teenagers hanging around flashed through my head. Then we saw a small blue arrow that had been tacked on a tree urging us to continue our search. Here's another shot of the arrow on the tree. We followed that arrow and found a path that diverged in a few places. I decided to follow the low lying path rather than scramble upwards. It was simply because after three weeks in France I had grown tired of climbing things and took the easy way. That choice prolonged our discovery. At first we came upon some stones that had clearly been some kind of physical structure, it just wasn't all that terribly impressive. It looked like ruins, but it was hard to discern any real floor plan or anything else by it. We started assuming that this was about all we were going to see and we were a little disappointed. We had already gotten used to the idea that in France once a building goes into disuse and disrepair that its stones become prey to being re-used for future buildings. We kind of thought that it this abbey must also have been scavenged for its stone. We walked further and found a larger path and followed that for awhile. Then we realized that we could walk for miles and head up back in Cajarc. We turned around to return to the little stone structure but were sidetracked again by luminous water. It was at this point that I started to get a little itchy. I knew there was more than what we first saw. I knew it in my bones. I went back to the original structure we found and I started scrambling upon those rocks and went upwards. I started thinking, "hey, this is more like it." My husband even snapped a picture of me with a triumphant look on my face as if to say, "look what I found." Ah, but we were still finding the edges of our abbaye en ruines. We started going back to our car when I remembered that there were paths leading upward that I had consciously passed by. This time I decided to follow them and see where they would lead. To give you a perspective of just how small that doorway was - I crawled through it. And then, well, here's a more triumphant look on my face. My husband even had to grin as he sat upon an ancient wall. We had found the monastery that according to legend was once founded by Saint Namphaise. Something was still standing. It may be in ruins, but you can still make out arches, walls, and possibly a well. I'm not an archaeologist nor am I an expert in architecture, but unless someone definitively states that this structure had to have been from a later period of time and gives me good documented reasons - I am of the belief that a contemporary of Charlemagne once stood on that same ground. That the building was made either at the time of Charlemagne or before. However, I do part ways from believing everything that is in the legends that I've read, particularly when it comes to the accusation of child sacrifice and cannibalism that occurred after Namphaise left the abbey. Maybe it is because it is so horrific that I simply do not want to consider it as being reality. However, I am skeptical by nature and after having read W. Aren's The Man-Eating Myth: Anthropology and Anthropophagy I am particularly hesitant to believe that part of the legend. Arens conducted a study showing that accusations of cannibalism are far more prevalent than documented cases of cannibalism. Accusing people of witchcraft, child sacrifice, and cannibalism has historically been done in order to condemn individuals or groups of people, and it was particularly prevalent in the Middle Ages. It was also difficult if not impossible to prove innocence, which is what the witchcraze was all about. I will say with confidence about that aspect of the story is that there is a consistency in the tale. I also cannot say definitively if Namphaise ever was a soldier under Charlemagne. He could have been because there were thousands of men who served in Charlemagne's armies during his reign. Then again, maybe that claim about Namphaise was all about resume padding. We may never know for certain. We can only say that the legends about him includes a consistent mention of him being a former soldier for Charlemagne, and at least one source mentions the defeat at Roncevaux. Regardless of the truth or truthiness to the legend of Saint Namphaise, it felt incredible to have that historic site all to ourselves. No vendors trying to sell us something. Nothing, but peace and quiet. We then left in search of lunch and the next abbey associated with Saint Namphaise. Once we returned to our car we looked through the trees and saw what we had missed before. Then we left Gouffrey de Lantouy, but not before my husband stated his opinion. Next time I will show you the abbey at Marchilhac-sur-Célé and tell you about my search for the tomb of Saint Namphaise. Superb. It's great when you can leave behind the guidebooks (and fellow tourists) and explore the past on your own. I am delighted by what you discovered. Of all the sights we visited, this one is my favorite because it is unique. No one else when they hear my story will be able to turn around and say, "yeah, but when I was there..."
I have to thank you for encouraging me to pursue these leads, scant as they were. I actually felt like Nancy Drew following clues. I'm not certain about the historical accuracy of the legends and the age of the ruins, but that is for experts in the field of archaeology or architecture to determine. We did this on our last travel day in the Midi-Pyrenees, but it will by far be the most memorable for me. Lillian sent me this comment and agreed to let me post it to my blog. Thank you for your feedback. I never know if what I write is going to be enjoyed by those who stop by my blog, but I feel like I should write what interests me. It is nice to know when someone appreciates my work.